When I was about 10 or 11 years old, my father gave me a ships clock. I have no idea where he got it, but I’ve had it almost 50 years. The clock indirectly caused some concern to my daughter’s first grade teacher when she was teaching them how read an analog clock. The teacher asked the kids to draw a clock face showing 6 o’clock. My daughter drew the clock hands; big hand straight up, little hand pointing to the right. This was, according to the teacher, wrong. The teacher then asked the kids to draw a clock face showing 12 o’clock. My daughter drew the clock hands; big straight hand up, little hand straight down. This was, according to the teacher, wrong. By then, my daughter was a bit frustrated and this resulted in a letter coming home for either my wife or I to sign. The note said something about her irrational insistence that her drawings were correct. I took the clock off of the wall and the next morning, I brought my daughter (and the clock) to school. When I showed the teacher, she was surprised. “I’ve never seen one of these before.” was her comment. Once I explained the difference between 6pm and 6am on this clock, she went on to say she now understood why my daughter kept asking, “Morning or afternoon” for each clock face, but the teacher still said my daughter’s clock drawings were incorrect. About 5 years ago, the clock stopped working, but I didn’t do anything about it at the time. As they say, “Even a broken clock is correct sometime.” In this clock’s case, it was correct once per day. A few months ago, I finally got tired of the non-working clock and took it to a clock repair shop. The clock maker had to fabricate several new parts to get it working, but three months later, it’s back home and working perfectly. I’m sure my dad, if he was still alive, would be glad to know that his gift to his then young son is still cherished. Test Daughter. That’s what she calls herself when asked about our relationship. I worked with her dad and met her when I came by their house to help her dad move some stuff from a pickup truck. She was 6 years old. It was one of those relationships that just kind of grew–both with her and her parents. Our families call her dad and I “the other half of each others’ brain”. I was at their house a few times a week and I slowly, unknowingly, became her 2nd dad. When she was a teenager, she told me that one comment was what cemented our hearts together. I didn’t realize that she had heard the exchange, nor at the time did I think it that important. Even though she had figured out I was her 2nd dad at age 6, it took me 2 more years to figure it out. She was 8 when she took her dad and I over to meet her little league coach. “Coach Kim. This is my dad and this is my 2nd dad. I have two dads.” Her coach gave the three of us a faint smile before running off…and I felt HONORED. Since I was trusted and not living there, it was often easier for her to ask me the “AWKWARD” questions. I answered them truthfully and honestly, even when I was wanting to run and hide. Later she said that my matter of fact answers and return questions did much to keep her “out of trouble”. She and her dad have very similar (impatient) personalities and often clashed during the “teaching moments”. While her dad taught her how to drive, the personality clash was making it a problem for her learning how to parallel park and use a manual transmission car. So, I got to do both of those things. It took her 10 minutes to master parallel parking and another hour for her to learn how to parallel park a car with an attached trailer. She still shows off that trailer parking skill and taught her husband how to do it as well. For the manual transmission, I kind of “got even” by borrowing a friend’s 1948 truck with a non-synchronized gear manual transmission (double clutching). But she showed me. It took her a couple of hours to not stall the engine when starting out, another hour or two to not give us whiplash and another day to not grind the gears when shifting. She liked that truck so much that it is the one she used for her driving test. She called me after taking the test and said her test lasted only 5 minutes, but she passed. Her dad was laughing and said her wanting to use that truck for the test was a stroke of genius. Apparently the driving test administrator got into the truck, realized it was 110F and the truck had no air conditioning, asked her why she was double clutching the transmission, had her pull out from one parking lot entrance onto the roadway, made a comment about the perfect shifting and immediately had her pull back into the other parking lot entrance…and announced she had passed. A year later, some (fortunately it was a false positive) medical tests indicated her dad had a fatal disease. It took two weeks for the more accurate final test results to come back and, like I said, the initial results were incorrect. I was pretty upset at the prospect of losing my best friend and his daughter, in tears, came to me, “If dad can’t give me away at my wedding, would you?”. Just like with the 2 dad’s comment, I felt so amazingly honored. Fortunately I did not need to fulfill this role. When she was 24, I was the 5th person to find out about her engagement…herself, her fiancee, her mom and dad, and finally me. At her wedding there was the mother-son and father-daughter dances. Next, the DJ started going through the father daughter dance part again. I, and everyone else, was looking around, confused, wondering how the DJ had managed to mess things up so much. At this point, I realized she was walking toward me and extended her hand to me. I, too, got a father-daughter dance. While we danced, I reminded her of my and her dad’s comment about the quarter. “If you’re on a date and he wants to do something that you’re not quite sure about, give him the quarter and have him call your dad, or me and we can talk about it.” We hatched a plan. After the 2nd father daughter dance, someone asked her about the 2nd dance. He was just as annoying and protective of me as my dad . He was my 2nd dad and I was his test daughter…like he was testing the waters to see if he wanted one of his own…that if he changed his mind, he could give me back. Oh, the plan we hatched. That evening, after the reception, my wife and I and my own daughter were sitting with her parents and reliving the memories. The phone rings. It’s her. “Dad. I gave Mark the quarter so he could call you. He wants to talk to you.” Her dad laughed and hung up the telephone. Happy 40th birthday, test daughter. You have an awesome husband and your boys are awesome too. By the way, the test worked out perfectly. My daughter is much like you..and I could not be more happy. It was about now in 1997 when my wife’s pregnancy test showed the two lines (pregnant). I was excited. My wife was not quite so excited at first, but as time went on, and she could feel baby’s movements, her excitement level went *WAY* up. Our daughter was born in early January, 1998. We left for the hospital around 5am and she was born at 12:30pm. She weighed 6-1/2 pounds and was just over 20 inches long. I still remember the feeling of amazement and awe as I looked at her laying in the little plastic bin on the weight scale. These memories are so strong that it seems that this happened just a few days ago. Rolling over, crawling, solid food, first words, first steps, planting sunflower seeds, helping me in the garden, reading, first day of kindergarten, school dances, 8th grade graduation, driving license, prom and yesterday, high school graduation. Yesterday I left work early and when I got home, my daughter asked if we could go to the shooting range. Normally I get home too late to do this. I happily agreed. She usually shoots a .22LR rifle, but tonight she wanted to try the pistol out. The pistol is a Ruger Mark 3 .22LR caliber pistol. It’s one of my favorite pistols to shoot and it’s a perfect for someone (like her) just learning how to shoot a pistol. If you look closely at the target, you can see a thick yellow line at the top center of the target. Those are where the bullets struck the target. I took the picture just after she fired her 8th shot. When we pulled the target in to check the target, all 10 shots had hit “right there”. You are correct, she is not hitting the “bull’s eye”. Learning to shoot well enough to get the bullet strikes clustered together is the difficult part. A simple adjustment of the pistol will move the cluster to the bulls eye. Since it’s my pistol, and it’s adjusted for me, she had to be content with “clusters”. When she turns 21, if she wants a pistol, I’ll get her one. I will also buy a *strong* lock box for the pistol…it’s the gun owner’s equivalent of a pool owner’s fence. We have been, with our daughter, visiting several college campuses. So far she has narrowed the field of choices to two. One is in the mountains. The other is in the desert. While the school in the desert is my alma mater, I (secretly) hope she chooses the mountain school. I know her choice will be a sound one and I will not interfere in her choice. Classes were in session during our visit and it was quite interesting for me. I could close my eyes and be “back there” again. It was an eerie feeling, but one I greatly enjoyed. What I appreciated most was the energy and hope radiating from the “kids”. I was like that more than 30 years ago. I need to be that way again. I do not want to be an old curmudgeon. 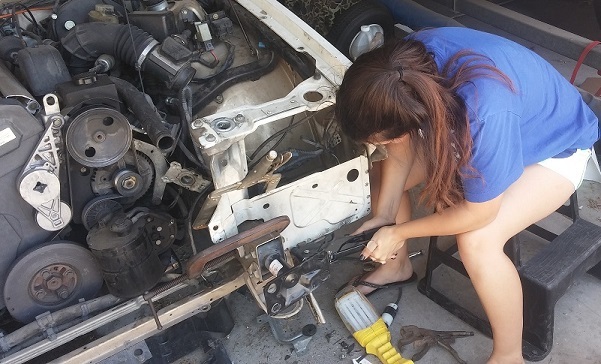 I managed to get a picture of our daughter pop-riveting the replacement panels in place (she hates having her picture taken). Basically it’s clamp everything lightly together, move it around until it’s aligned, clamp it tightly and then pop-rivet it all together. The pop-rivets allow us to remove the clamps and have everything stay in place during the welding. It’s more work doing it this way, but I figured she would have an easier time with the wire welder if the clamps were not in the way. I’m not doing this to be a mean dad. It’s actually quite the opposite. The most important thing I can do is to impart knowledge to her so she can be a confident and capable young woman. She is smaller and less strong than I, so we had to find some new ways of doing things, but that’s part of life……Her answering the question, “How can *I* do it?” is an awesome thing. Our daughter gave her 1993 Volvo 960 sedan the name of Lucy. The collision damage was not terribly severe. If this were a new car, the easy way, get all new parts from the dealer, would make this a quick, easy and moderately painless procedure. However, since the car is old, and we didn’t want the cost of repairs to exceed twice the value of the car, Lucy was “in critical condition” and “on life support”. After two fruitless weeks of searching junk yards, we were about ready to “pull the plug”. Our daughter’s cell phone has an unlimited data plan. Normally she only uses slightly more than the lowest tier plan, but…sometimes….like this month…she uses a tremendous amount of data. We get there, pay our $1 “cover charge” and…there it is, an early 1993 Volvo 960. It’s a wagon instead of a sedan, but the front is the same. We got a hood, the two fenders, most of the plastic parts that hold the headlights in place, the actual headlights and the parking lights. We still need the air conditioner condenser coil, the grill, the turn signals, a radiator, the inner fenders and the hood latch supports. This white Volvo 960 has the needed inner fenders. We would have gotten them on Saturday, but I didn’t have the tools needed to remove the spot welded panels. The junk yard was closed today, so I’ll take tomorrow afternoon off from work and get the inner fenders and hood latch supports. So, we’re on our way. Lucy is much less likely to be scrapped. Our daughter has been doing most of the work. I show her how to do something once or twice and then let her do the rest. It’s been a great learning experience for her. She’s learning how to use tools, and even more important, how to figure things out…this panel is still not coming loose…..hmm…it feels like there might be a bolt here….yes..there it is……Ok now it’s loose.